The makeup of this year’s panel is very different from that of Soccer Panel at SSAC 2012. 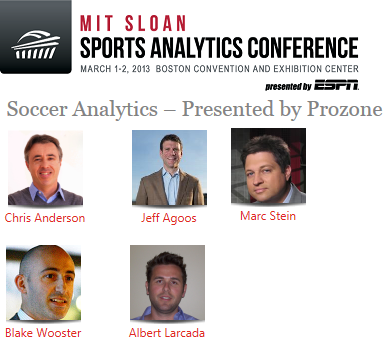 Dominated by “club insiders” last year, this year’s panel had a mix of “outsiders” like Chris Anderson, Blake Wooster from Prozone represented the data companies, Albert Larcada from ESPN coming from media and Jeff Agoos, a former player and Technical Director of MLS. Marc Stein moderated the panel as was the case last year. This year’s panel took a completely different track compared to the panel from last year. Last year it surrounded around how analytics is used, where it is useful and the importance of context and trust. The biggest challenge cited in 2012 was the availability of good data to work with. This year it centered more around how much analytics is used by managers, metrics, visualizations – use of analytics in the media and trust (a repeat theme from year). The panel started off with a historic perspective of soccer analytics from Chris. I thought it was a very good beginning that gave the audience an idea of how far we have come. Albert’s examples of using heatmaps of Messi and Ronaldo in the build-up to the “Clasico” in SportsCenter showed how data is being used to tell a story. The challenge in a scenario like SportsCenter is that the announcers need to be able to explain the graphic and tell the story in less than 10 seconds. Choosing the right type of visualization is key. I also liked the idea of “visualization is analytics” quote from Albert. All visualizations are an approximation of the raw data. If done right, they can tell a story not just in media but also inside a soccer club. How much analytics is being used by the club managers? What are the challenges in making the coaches use analytics? Metrics – what do we have today? Chris tried to answered this based on his experience working with clubs as a consultant but the viewpoint of an “insider” (like an analyst at a club) citing examples where analytics has been used by a manager successfully would have been a good counter-balance. It is always tough balancing act to not reveal confidential details and have a frank discussion but I felt that the club angle was addressed better in last year’s panel. West Ham United’s manager Sam Allardyce talking about how he uses analytics is a good example. There was some great discussion on this one. Coaches have a lot at stake and they may not be willing to use something new unless they know (with a high degree of confidence) or trust that it will help them but they won’t know for sure if it will be useful unless hey use it. The classic chicken and egg. A great example was the importance of survival in a promotion-relegation environment and how that pushes managers and front-offices more towards short-term thinking and immediate results. Daryl Moorey, the GM of Houston Rockets and a co-chair of the SSAC brought up a great point in the “Revenge of the Nerds” panel about how the front office needs to support and persist with analytics. Managers may not trust it right away but if they find it useful over a period of time they will eventually come around. Blake had a point when he stressed that the onus is on the analyst to communicate the value of analytics to the coach. If the coach doesn’t see value in it, it is probably because the analyst didn’t do a good enough job of conveying the message. In the talk “Why we don’t understand Luck” by Michael Mauboussin one of my favorite talks of the conference, Michael stressed the importance of evaluating things based on the process (which is very hard to do) rather than the outcomes (which is easy and what we do normally). I believe that analytics is being used differently in different clubs (hardly surprising). It has a complimentary role as “another tool” in the overall toolkit for success. The two key themes that resonated across the 2-day conference “communicating the message” and “winning the trust of coaches/decision-makers” are very important. This is probably one of the most debated aspect of soccer analytics today. What metrics do we have? What is the equivalent of Baseball’s WAR in soccer? There is a lot to gain from knowing the process of how analytics and metrics work in other sports but every sport is unique and presents its own challenges. It is a fact that we haven’t been able to model soccer matches as well we would love to. Albert brought up a great point about how the paucity of scoring on soccer makes it much harder to model than almost every other team sport. We haven’t yet come up with a formula that tell us how to win a game or score a goal. That is because there are many ways to win a soccer game. Different coaches employ different systems. A metric/KPI valued highly in one system might not matter at all in another system. For example, speed on the ball and accurate long-balls might be very important in a counter-attacking system but may not be that important in a short passing system. Charles Reep, probably the first soccer analyst, concluded that most goals were scored from fewer than three passes: therefore he concluded it was important to get the ball quickly forward as soon as possible. While his statement might still hold true, the “How?” is the key question. The answer is not as straightforward. The quickest way to move the ball is for the goalkeeper to hoof balls upfield and we know that it doesn’t work most of the time. I believe the availability of spatial XY-data + data from camera tracking systems (installed in most of the stadiums around the world today) in conjunction with video has helped in answering the “How” better. But we still have a long way to go. As Chris pointed out at the very beginning of the panel – This is not a revolution but an evolution. We are constantly evolving. I felt that the composition of the 2012 and 2013 panels were at the extremes in terms of “club insiders/outsiders”. A panel with a mix of the two groups would probably be more useful. Panel formats don’t lend themselves very well to 1-on-1 dialogue and interaction. An online Q & A chat session with the panelists during the conference is a good thing to try. I got similar feedback from a few others who attended the conference. Have Big Sam on the panel! – Seriously, having a manager who has used analytics and is willing to talk about it would elevate this panel to a whole another level. I am aware that EPL will be in season, but technology gives the option to have someone participate remotely. I have another post summarizing my views on the other panels I attended coming up in a few days.